The U.S.S. Explorer, NCC-74685, was an Intrepid-Class starship, the first Starfleet vessel to travel to the SW-1138 Galaxy. The U.S.S. Explorer was one of the many Intrepid-class ships pushed out during the end of the Dominion War, following the Chintoka Retreat. Lacking more capable commanders than material goods, Starfleet gave command of the Explorer to the young Zon Huntreas, recently promoted to Captain admist the carnage and bloodshed. Despite having only a general command background, Zon proved a capable leader throughout the remainder of the war. Following the Treaty of Bajor, hostilities against the Dominion ceased entirely, leaving many inexperienced commanders to take on the responsiblity of rebuilding the bulk of the fleet. Having spent the bulk of his command in battle, the transition back to that of science and exploration was a rough one. Zon found his talents for tactical situations were appreciated by Starfleet, but his lack of formal training- -and his love of the sheer adventure of space- -kept life onboard the Explorer interesting, if turbulent. The return of the U.S.S. Voyager to the Alpha Quadrant in 2377 granted Starfleet scientists and inside look at half a dozen new and extremely advanced forms of technology which had proven to be easily adoptable to Starfleet vessels. Chief among them was the promise of transwarp travel, particularly the Quantum Slipstream Drive, which the crew of Voyager had been almost able to perfect while being thousands of lightyears away from the nearest Federation starbase. Considering the possibilities which could be seen when giving the Quantum Slipstream Project the full support of the fleet, they assigned the Explorer and it's crew to the project, putting Zon in charge of R&D. While Zon missed the frontier, he would work on the Quantum Slipstream Project for three years, adapting the alien technology until it could be fully understood and utilized. After an initial test run, the Explorer was assigned to investigate the ruins of a strange subspace wormhole gateway that had been discovered burried on the fourth planet in the Delnevorian system, which was dangerously close to the Romulan Neutral Zone. Reaching the planet in hours instead of days, the Explorer was then caught in a quantum fissure which lead to the erruption of the Alpha Quadrant terminus of the Route of the Ages. 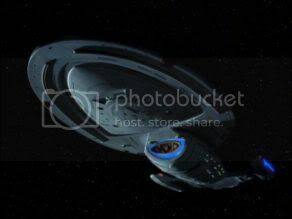 The Explorer then became the first Federation starship to reach another Galaxy. The Explorer was at first marooned similiar to it's sister ship, but after only a short while her crew managed to discover a way to use the Route permenantly and consistantly. Likewise, the odd radiation through the Route seemed to cause a holoprogram that had been running at the time, based on historical records, to spontaneously grant life and sentience to several of the holocharacters, 'birthing' Lucas Wolenczak, among others. Through the Route, the Explorer began to explore the new Galaxy, and proved to be on hand for the first contact with dozens of new races, both malign and friendly, including the New Republic, the Empire, the Cylons, the Tragolite Federation, and the Goa'uld. As the lead ship in the Quantum Slipstream Project, the Explorer was one of the few starships capable of Quantum Slipstream travel. The Explorer contained the specs of any Intrepid-Class starship, and all of the special equipment included, not least being the tricyclic input manifold of the warp core and variable-geometry pylons, as well as being one of the first classes to incorporate bioneural gel packs and was equipped with the Mark 1 Emergency Medical Hologram system. Due to the Explorer's status as a testbed for the Quantum Slipstream drive, she was equipped with the best navigational sensors, and the highest top speed of any Starfleet vessel until her destruction. Its multi-mission design was backed up by a main computer processor capable of simultaneously accessing 47 million data channels and sustaining 575 trillion calculations per nanosecond, and also spontaneously generating holographic lifeforms. Ambassador to the Republic: Cassan Fistwick, Jedi Knight. Much of the crew would be transferred to the second U.S.S. Explorer, although Blackwell and Salodos would be transferred to the Defiant-class U.S.S. Agamemnon. While the Quantum Slipstream Drive has been adapted to two other ships in Starfleet, as well as partially adapted to the later Galaxy-class Explorer (before the discovery of the Hyperspace-Subspace Barrier Coefficient), the spontaneous generation of the holographic life forms Lucas Wolenczak and Kathryn, has never been duplicated or understood.